We have a foot of snow in our corner of the world. Time for comfort food! 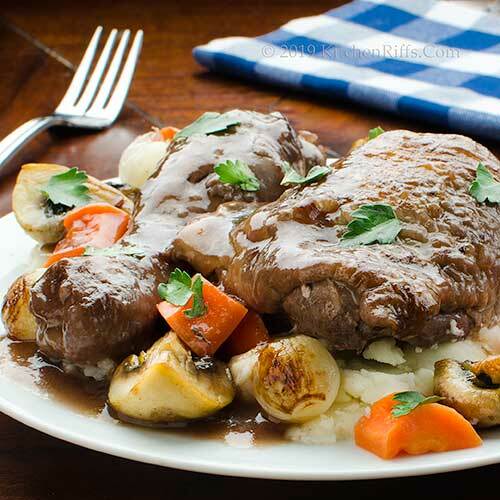 And what could be better than a meaty dish slowly braised in rich wine sauce? Enter coq au vin, a classic French recipe. It requires some prep work, but the result is so worth it. Serve this at your next dinner party and bask in the adoring applause. Adoration works for you, right? It’s traditional to use red wine in this dish, but you can substitute white if you prefer. In fact, one classic variation on this recipe uses a dry Riesling (and is called, fittingly, Coq au Riesling). Originally, the chicken used in this dish was a mature rooster (a “coq”) that required long cooking to become tender. But we don’t find that kind of bird in our supermarkets today – the chicken we’re likely to see is much less tough. Many cooks use a whole chicken in this dish, but we prefer to use just legs and thighs. They have a lot of flavor, and are ideal for braising. Coq au vin traditionally is served with a garnish of braised pearl onions and sautéed mushrooms (we like to serve carrots too). We always cook these veggies separately, but toss them in with the sauce if you prefer (see Notes). The classic accompaniment to the dish is parsley potatoes, though we think it’s even better served on a bed of mashed potatoes (a bed of buttered noodles would also work). Prep time for this dish is about 45 minutes. Cooking adds another hour. We often prepare this dish a day ahead, and then reheat it just before serving (the flavor is even better that way). This recipe yields 4 to 6 main-course servings. Leftovers keep for a few days if refrigerated in an airtight container. Preheat the oven to 300 degrees F. If using slab bacon, remove the rind, then cut it into pieces (“lardons”) of about ½-inch by 1 inch. If using thick-cut bacon, cut it into pieces about 1-inch square. Place the bacon pieces in a large Dutch oven (one that holds about 6 quarts) on the stovetop and turn the heat to medium. Cook the bacon in the Dutch oven until it begins to crisp (about 5 to 8 minutes). While the bacon is cooking, dry the chicken pieces and season them to taste with salt and pepper (we often skip the pepper). Dredge the pieces in flour if you like (just enough to coat each piece very lightly; we often skip this, especially if we’re preparing a gluten-free dish). Once the bacon is cooked, remove it from the pan with a slotted spoon and drain it on paper towels. Now brown the chicken in the Dutch oven – you’ll probably need to do this in batches so you don’t overcrowd the cooking pot. Place the pieces skin-side down and cook until the chicken is golden brown (5 minutes or so) and then turn the pieces over and brown the other side. Add oil or butter to the pan if necessary (it usually isn’t). When the chicken is browned, remove the pieces and place them on a plate covered with paper towels to drain the grease. While the chicken is browning, peel the onion, carrots, and garlic, then chop them roughly. Once the chicken has been browned, remove some of the grease from the Dutch oven, leaving just 1 or 2 tablespoons. Add the chopped onion and carrots to the Dutch oven, season to taste with salt, then cook for 5 minutes (the onions will be translucent, but not brown.) Then add the garlic and cook for one additional minute. Add the tomato paste and thyme to the onion mixture and cook for a minute or two. Then add the wine and chicken stock. Add the chopped bacon and the browned chicken pieces. Bring the wine to a boil. Then turn off the stovetop heat and drape a piece of parchment paper or aluminum foil over the Dutch oven (the edges should extend over the side of the pot). Push the paper down so it almost touches the chicken, then put a lid on the cooking pot. Place it in the oven and set a timer for 45 minutes. When the timer goes off, remove the cooking pot from the oven. Using tongs, remove the chicken pieces and set them aside. Place a strainer over a large bowl and pour the contents of the Dutch oven into it (the strainer will catch the vegetables). Using a spoon, press down on the veggies to extract as much liquid as you can. Now either discard the veggies or reserve them for the cook to snack on. Note: We usually prepare the coq au vin ahead of time, stopping at this point. We allow the sauce and meat to cool, then place the chicken pieces in a bowl and pour the sauce over them. Then we cover the bowl with shrink wrap and refrigerate it for a day (or two) until we’re ready to serve. If you’re not making this dish ahead, just continue on with the recipe. 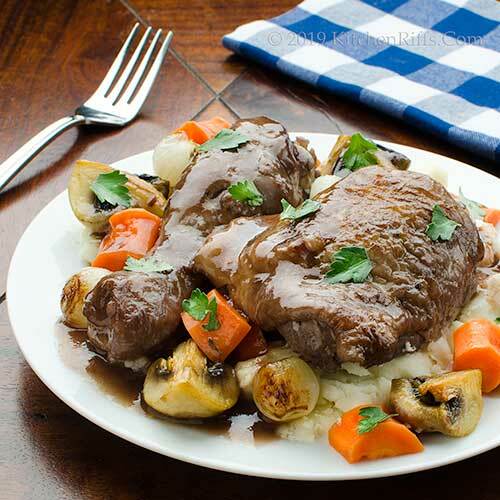 When you’re ready to serve the coq au vin, you’ll need to do the following: Reduce the amount of sauce to 2 or 3 cups; prepare the garnish of pearl onions, mushrooms, and carrots (if using); and reheat the chicken (especially if you’ve cooked it ahead of time). So first pour the sauce into a cooking pot large enough to hold the chicken, place it over stovetop heat, and reduce it to 2 or 3 cups. While the sauce is reducing, place the pearl onions in a microwave-safe covered dish and nuke them on high until they’re barely cooked – usually about 8 minutes. Then pat them dry with a paper towel. Take a skillet just large enough to hold the onions in one layer and place it on medium stovetop heat. Add a tablespoon of olive oil and heat until it shimmers. Then add the pearl onions. Sauté them until they begin to brown (about 10 minutes). When done, set them aside, keeping them warm. Prepare the mushrooms: Wipe them with a damp paper towel. Use the mushrooms whole or cut them into halves or quarters. Add 2 tablespoons butter and 2 tablespoons olive oil to the skillet. Add the mushrooms, season with salt and pepper, then add the thyme. Cook until the mushrooms are well browned. Set them aside, keeping them warm. Peel the carrots and cut them into pieces an inch or two long. If the carrots are very thick, cut them in half. Place the chopped carrots in a covered microwave-safe dish. Add a tablespoon or two of water and about 2 tablespoons of butter. Microwave on high until the carrots are done (8 minutes or so). Set them aside, keeping them warm. By now, the sauce should be reduced to 2 or 3 cups. Add the chicken pieces to the sauce and bring it to a simmer. Cook the chicken until it’s warm (usually about 10 minutes if you’ve cooked the chicken ahead and refrigerated it). Get ready to serve the coq au vin: Using tongs, remove the chicken pieces from the sauce and place them on serving plates (we like to serve the chicken over mashed potatoes). Remove the sauce from the heat. If you want to thicken the sauce, stir together equal quantities of corn starch and wine or water. When you’ve formed a slurry with those ingredients, stir it into the sauce a bit at a time until the sauce reaches the consistency you desire. Garnish the plated chicken with the pearl onions, mushrooms, and carrots (serve them on the side or put them on top). Add a big spoonful or three of sauce. Mince some parsley, if desired, and sprinkle it on top. Serve and enjoy. You can substitute salt pork for bacon if you like. Many people like to blanch bacon or salt pork in water for 5 minutes before cooking it (Step 1). We haven’t tried this, but it’s supposed to remove the smoky flavor. Some cooks like to dredge the chicken pieces in flour before browning them. If you do this, you probably won’t need to thicken the sauce with corn starch at the end. After dredging, make sure to shake off the excess flour – you don’t want to use too much. BTW, flour (not corn starch) is traditionally used for thickening the sauce in this dish. We prefer corn starch because it’s quick and easy to use, and just a bit healthier. Some cooks prefer to remove the chicken skin after browning and before braising. That’s not us, but if it’s you, feel free to do so. We generally use frozen pearl onions because they’re easy to manage. If using regular unfrozen ones, you’ll need to peel them. To simplify this process, first cut off the root ends of the onions. Then blanch the onions in boiling water for 45 seconds or so, remove them from the heat, and plunge them into ice water. The peels will slip right off. As noted in the recipe, we prepare the pearl onions by first microwaving them, then sautéing them in olive oil. Want to try an alternate method? Brown them first in a small frying pan. Then add water or wine and cover the pan. When the liquid has evaporated (this will take about 20 to 30 minutes), the onions should be done. If you use wine, they’ll have a particularly nice flavor. It’s not traditional to use carrots when cooking the chicken for this dish. But we like how the flavors of carrots and red wine work together, so we always use them. As noted, we like to serve pearl onions, mushrooms, and carrots as garnish for the chicken. We generally prepare these veggies separately when we’re getting ready to serve, but you can just add them to the sauce (Step 7) while you’re reducing it. By the time the chicken is warm (Step 11), they should be done. This dish tastes best when you use homemade poultry stock (chicken or turkey). That’s because a stock made with plenty of bones has natural gelatin, which adds body. But canned stock or chicken base will work OK. Which wine to use when cooking this dish? Burgundy is traditional. Or you could try pinot noir. But we prefer to use a Côtes du Rhone – you can get a good cooking bottle for $10 or so. Or ask your friendly wine merchant for a recommendation. Most of them love helping their customers (and if they don’t, find a different wine merchant). We like to use dried thyme in this dish (or fresh, if available). But other herbs would work, too. Fresh rosemary is wonderful. Interesting fact: Traditional coq au vin is made with some of the blood from the rooster that’s being cooked (this started as a farm dish, so it was assumed that the cook was also the one who slaughtered the chicken, and could collect some of the blood that drained from the bird). Fresh rooster blood isn’t available in our modern supermarkets (and most of us wouldn’t want to use it anyway). So cooks sometimes add a bit of chicken liver to the sauce to give it some of the earthy flavor that rooster blood would add. “But at least you can still crow about your accomplishments,” said Mrs K R.
Guess there’ll be a chicken in every pot around here. I wish I could reach into the screen and dig right in! It looks so GOOD! Well done, John! Hi Angie, it's a wonderful dish! :-) Thanks for the comment. Great winter idea. Last time I made coq au vin I used a recipe that suggested boiling down the wine & stock before cooking, which is easier than straining it out at the end, and makes the whole process more streamlined. About raw pearl onions, you wrote "The peels will slip right off." This has never happened to me. I use the frozen kind now too. I have heard that in Germany they sell raw pearl onions that are already peeled. I wish! Hi Mae, I've been lucky in getting my pearl onions peels to slip off. Sometimes takes a try or two before it happens, though! I've made this recipe the way you suggest -- reducing the sauce first. It does make sense because the chicken takes so little time to cook. But I keep on doing it this way, mainly because I like to make the dish a day ahead, and let the chicken soak in the cooking liquid in the refrigerator. Extra liquid at this stage means it's easier to cover all the chicken pieces in the wine/stock mixture. Thanks for the comment. 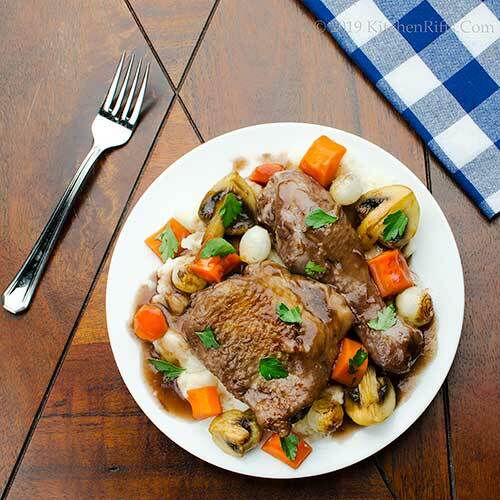 Cog au vin is the perfect dish for a rainy and stormy day here in California. I never made it , thanks for sharing and motivating me to try it. Hi Gerlinde, it's a great dish -- make it once, you'll make it again and again. It's good! Thanks for the comment. A wonder hearty winter dish. The smell of the coq au vin braising on the stove while sipping a glass of red, perfect. As for whole vs chicken parts, I'm with you John, it's always the hindquarter. And, I know this will be on Mrs. KR's table again because your not going to chicken out. It's not even ten in the morning and you have me seriously hungry. This looks and sounds wonderful. Hi Ron, no chickening out here! :-) This really is a great dish -- can't imagine why I haven't made it for so long. Thanks for the comment. Hi Terry, this IS wonderful! Wonderful winter food. Thanks for the comment. Hi Pat, perfect winter comfort food! Really good stuff. :-) Thanks for the comment. Coq au vin is my favorite French clasic recipe. I sometimes request it for my birthday. Great recipe you have hear and did not know about the Coq au Riesling. Hi Evelyne, terrific dish, isn't it? Birthday-worthy! Thanks for the comment. I love coq au vin and have not made it in quite a while. I am going to use your recipe and tweak it slightly to make it keto. This might signal a menu change this week! One of my favorite dishes in the world! There is nothing like this kind of comfort on a cold womter’s day! Strut away! Hi Anne, this is a pretty easy recipe to adapt to your own taste. Good thing you're pretty flexible with your menu changes! :-) Thanks for the comment. Hi David, loads of strutting around here. :-) Thanks for the comment. Love this! I've never made coq au vin with pieces of chicken. It's so much prettier that way! I also always cook the mushrooms and onions separately, as well as the salt pork, which I was instructed to do in the first recipe I ever used to make it. I should branch out, because there are obviously more ways than one to make it! Hi Sue, this would be a good dish for an Instant Pot. Looking forward to seeing yours. :-) Thanks for the comment. Hi Mimi, there are a lot of variations on this dish -- but at the end of the day, it's just chicken braised in wine. And with mushrooms and onions, of course. :-) Thanks for the comment. I was just thinking about making coq au vin as I've never made it before. Interesting fact about the addition of the liver. So fascinating to about the evolution of this dish! Hi Pam, it's going to be miserable here again this weekend, so we'll have to make another batch. :-) Thanks for the comment. Hi Laura, we've never made this with the liver, but have seen numerous recipes that do use it. Have to try it sometime! Thanks for the comment. What time is dinner? Looking for flights now! Seriously John, this is one of our favorite comfort dishes. Photos are just stunning! Oh this looks good! Bet the smell of this cooking gave your home such a warm and comforting smell. How were you able to wait a day before eating? 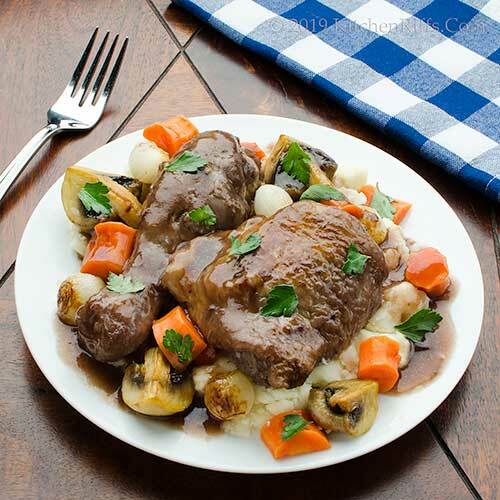 :) I have never made a coq au vin but it is a dish that is one my wish list. Thanks for your recipe and for mentioning that your used a rooster. The lady we get our eggs from sells roosters and laying hens that I buy once in a while and as your mentioned, they do need to cook longer to become tender. Need to start planning ahead. Thanks John! Hi Greg, and highly sought after, it is! :-) Thanks for the comment. Hi Bobbi, super dish, isn't it? Thanks for the kind comment. Hi Gingi, try, try again. :-) Thanks for the comment. Hi MJ, if you can get rooster, that would be awesome! In that case, definitely cook it longer than we suggest. Otherwise, supermarket thighs and legs would be a lot more convenient. :-) Thanks for the comment. Sounds like a wonderful meal---especially during this recent cold spell! It's been way too long since I've made coq au vin an your version sounds perfect! Hi Liz, it was a GREAT meal. :-) Thanks for the comment. I hate to admit this but I'm certain I've never made this classic dish. It looks so comforting I'm not sure why I've never attempted it. Now I will! Hi Vicki, you HAVE to make Coq au Vin -- it's such a terrific dish. You'll be glad you did. :-) Thanks for the comment. Hi Dahn, the flavor payoff is so big, the time spent making it is definitely worth it. Thanks for the comment. THIS is truly comfort food. Winter has its advantages when it comes to food that is homey, warm, and fits the mood of curling up with a good book. John, this looks delicious! A foot of snow? I'd need comfort food too! This sounds delicious--stay warm! Hi Merryn, we LOVE big flavor! :-) Thanks for the comment. Hi Judy, it really is delish. And you're right about winter comfort food -- although we have to put up with the cold and snow to get it, the food is such a pleasure. Thanks for the comment. Hi Kelsie, it's raining now so the snow is disappearing. But more snow this weekend. :-( Thanks for the comment. Beautiful plate of food! I haven't made coq au vin for at least a year -- must remedy that. Like you, I make it with carrots and serve it with mashed potatoes. You've reminded me of how much I love and have missed Coq au Vin. I haven't had it for years, and it was my mom's favorite thing to order if it was on a restaurant menu. Such a great recipe. Thank you! Hi Jean, mashed potatoes are wonderful with this dish! Thanks for the comment. Hi Lea Ann, yup, the chicken does absorb some of the wine, and thus changes hue. Good flavor, though. :-) Thanks for the comment. Hi Valentina, we hadn't made it for years, either, until we made it for this post. I had forgotten how much I enjoyed making it. Thanks for the comment. Wow - what a fantastic looking Coq au Vin! And, I love your idea of serving this on a bed of mashed potatoes as opposed to parsley potatoes! Hi Shashi, parsley potatoes are good, but mashed potatoes are better. :-) Thanks for the comment. Just taking a look at your chicken, you know why this is a classic. I like adding carrots too, not only for their sweetness but also the color that they add to a brown dish. Hi Karen, carrots really do add a nice pop of color (and flavor!) to this dish, don't they? Thanks for the comment. It's snowing right now and I could use more than chili. This sounds great John and is such a fun classic.Great time to share! Hi Abbe, a Sidecar before dinner will help ward off the cold. :-) Thanks for the comment. That looks so good and so tempting. We have always ordered this dish at a restaurant and never made it at home. I am bookmarking your recipe to someday. thanks for sharing. What a wonderful dish to beat back the winter weather with. I made coq au vin once, and it didn't go so well. It tasted OK, but it looked at unappetizing color. I should give your directions a go. Hi Taruna, we often order this in restaurants, too, and haven't made it for ages -- and then wondered why not? It DOES take some effort, but is actually a pretty easy dish, and SO GOOD! :-) Thanks for the comment. HI Emma, we're currently getting freezing rain, and will soon get snow and bitter cold temperatures. Time to make this again! :-) Thanks for the comment. Hi Jeff, there are things that can go wrong when you make this, but this recipe works. :-) Thanks for the comment. Hi Natalia, we like to think we have the best restaurant in town. :-) Thanks for the comment. Oh this looks perfect! So hearty, rich, and comforting for a winter day. I spent my birthday one year with Julia Child on PBS and myself in the kitchen making her Coq au Vin...it is the perfect dish. Rustic and elegant at the same time. Of course now I'm totally craving it and must try yours! Hi Amy, it's wonderful winter comfort food! :-) Thanks for the comment. Hi Barb, spending a birthday with Julia sounds delightful! :-) Thanks for the comment. I always think of Julia Child when I think of this dish. Like her, it's a classic full of heart and soul. Hi Carolyn, I often make this using her recipe! Although most recipes are pretty similar (well, except for the ones that require chicken blood as an ingredient!). Thanks for the comment. I've seen some snow in my travels but none at home yet. Coq au Vin is the absolutely first dish that The Hubs made for me when we were dating (with many phone calls to his mother I found out later). Stay warm and thanks for sharing. Hi Debra, we missed the snow yesterday, thank goodness, but it's snowing now. And is COLD. We need some of this. :-) Thanks for the comment. And oldie but a goodie! One of my favorite ways to make chicken, in fact it might be my very favorite, even if it's not Italian. And I agree 100% about the breast, better to save it for cutlets or some other use. Doesn't really take to long, slowing cooking. Hi Frank, isn't this such a nice dish? Loaded with flavor! Thanks for the comment. I've never had this before - the recipe looks fun to make and so tasty! Hi Pam, definitely a dish you want to try at some point (either make it yourself, or in a restaurant) -- SO GOOD! :-) Thanks for the comment. Hi Rocquie, it is! :-) Thanks for the comment.